Last Thursday, I was – again – invited for some alcohol tasting. To all teetotalers reading the blog: if I ever get invited by a fruit juice of water bottler, I’ll write about it too, honour bright! 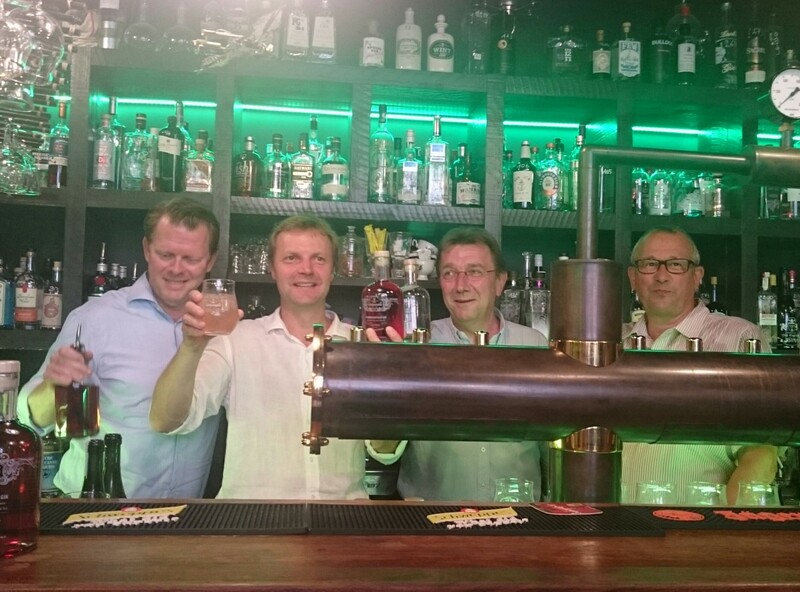 Two smaller companies collaborated to put yet another Belgian gin on the market and present it to the world in a fancy absinth bar, Greenlab, on the avenue Louise on a hot, sultry evening. There is a chauvinistic reason as well. 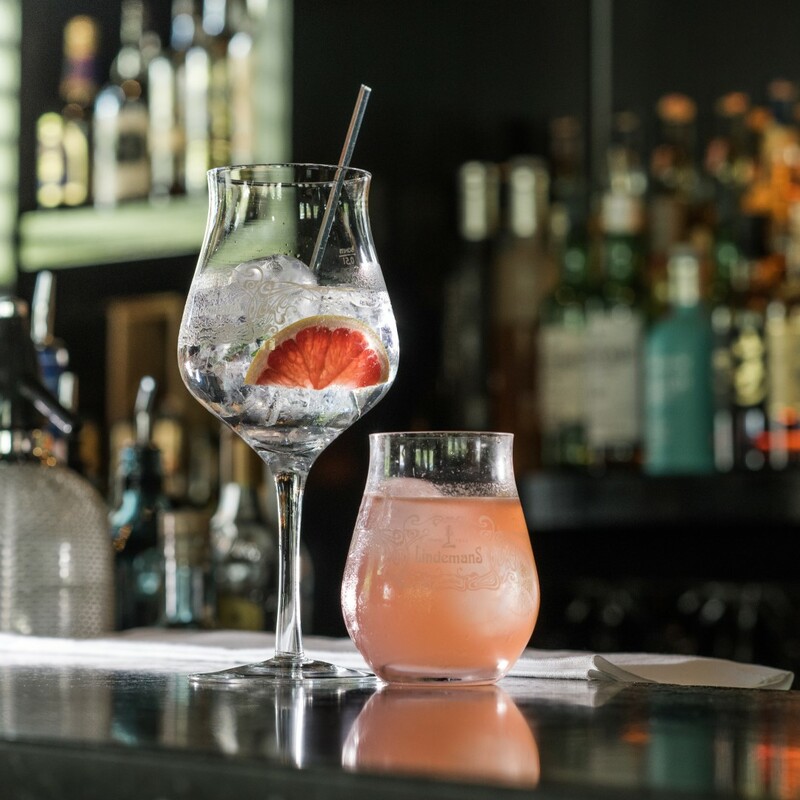 Although most people think that gin is native of Britain or more specifically London – yes, I blame all the Victorian literature – gin was actually distilled first in the Lowlands as far back as the 16th century. The liquor contained indigenous botanicals such as juniper berries and was therefore known as “jenever”. English soldiers, on their off-time during the Eighty Year’s War and maybe even while on duty, abbreviated the name to “gin” and afterwards took back the beverage and some of the distillers to London. The popularity and spread of gin really is a merit of the English. 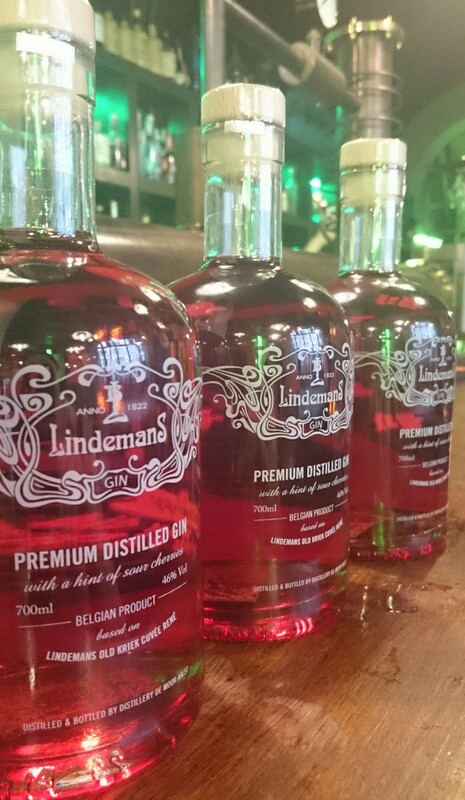 It took one connoisseur, Maurits Van Den Eynde, with a vision of a real Belgian gin, Lindemans, a family owned brewery renowned for their sour cherry flavoured beer and Stokerij De Moor, who’s been distilling alcohol for over 100 years in their production plant, to come up with not one but two Lindemans Premium Distilled Gins. Both gins are a result of combining a distillation of 15 different botanicals with a distillation of Oude Lindemans Kriek Cuvée René. This beer was brewed with whole cherries, according to the tradition of the Belgian Lambic. La petite histoire tells us that an American importer named this beer after René, the 5th generation of family brewers, father and uncle of the current generation now at the head of the company. The gin is being distilled twice in small batches and as there is no automatic production line at Stokerij De Moor, bottled and corked manually. There’s a clear gin and a red gin, the colour being a result of the added pure sour cherry juice. Oh, and apparently you’ll have to drink it within 8 months as the colour will change over time. What a shame. So, Thursday night we were welcomed by Manuel Wouters. Any Belgian gin lover will know this household name, owner of cocktailbar SiPS in Antwerp and at his 3rd book on gin by now. From a martini workshop I remembered that if you fold the thinly sliced zest, this will fully release the aromatic oils into your cocktail. A golden tip from Wouters: do not drink a fizzy cocktail with a straw as this will kill the carbonic acid. Which he followed himself by putting a cut straw in the glass. Anyway. Do not be put off by the colour (a very light pink) which might lead you to think that this is a woman’s drink. It’s not! It is however a summery, slightly fizzy cocktail, very fresh thanks to the juice but you can still taste all the botanicals used. Do not empty the tonic bottle in the glass, but let the guest choose the dosage of his poison himself. As both gins are very aromatic, make sure you use a neutral tonic or other additives. Very tasty G & T classic. Although I was supposed to taste citrus first and then cardamom and cherries, I got sidetracked by the whiff of rosemary needles and only tasted the warm cardamom spice. By that time I also tried to sip the cocktail through the swirling stick (twice), so don’t be led too much by my judgment though (except the one about ‘very tasty’, it really was! I heard everyone say so). The first bottles to be sold at the Lindemans Brewery will be numbered. And as they come in small batches, don’t wait too long to let yourself be convinced that this is really a good addition to your gin collection. Image Credits: © Rob Mitchell, © Ann Glorieus. I bought some bottles, we’ll settle a date soon ? Jeeuj! I think that’s a great idea!